Hands-down, this is my first choice for seeing color up close on a run during the fall. 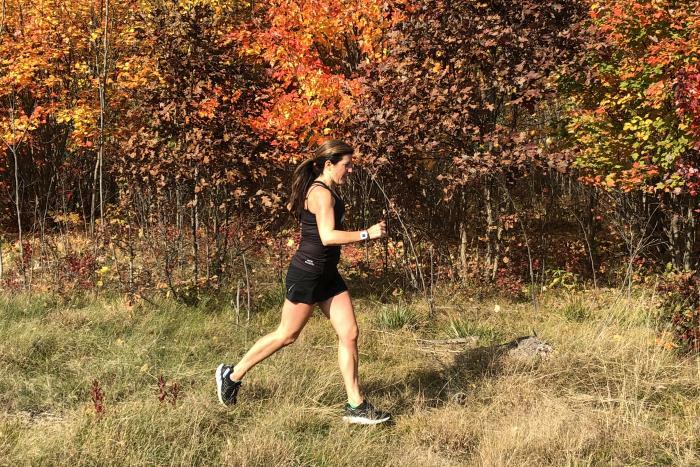 You can choose your distance with 5K, 10K, 25K loops, all in the Pere Marquette State Forest. I often can’t help myself from pausing mid-run (maybe at the top of a hill) to gawk at the beautiful leaves. I like to enjoy a cup of coffee pre-run at Breakaway Cafe at Four Mile Road and US31 North/Munson Avenue, or I may plan to stop in for one of their delicious breakfast burritos when I’m finished. If you’re looking for a paved experience, these trails are for you. The TART is a 10.5-mile “urban transportation corridor” with an eastern end point of M-72 (Bates Road) in Acme Township and a western end point at the M-22/M-72 intersection in Traverse City. It’s flat and easy to navigate -- I’ve logged many longer runs along this path that treats you to views of both East and West Grand Traverse Bays, through neighborhoods and the Mitchell Creek watershed. (One great route: starting at the library and taking the trail that hugs a good chunk of Boardman Lake; stop by the Filling Station for pizza and patio-lounging afterward.) 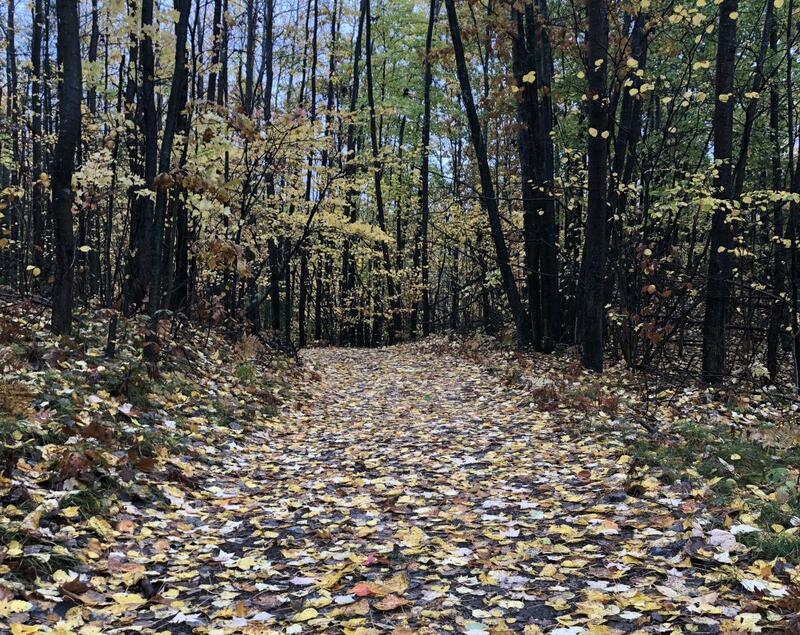 You’ll also witness stunning fall color on the Leelanau Trail, which is connected to the TART and has its trailhead at Cherry Bend Road. You can park there and head toward Suttons Bay for views of towering trees, open fields, old barns and rolling farmland. Want even more water views throughout your run? Start at the base of Old Mission Peninsula and head out East Shore Drive, also known as the beginning of two well-known local races: the Bayshore and the National Cherry Festival of Races. The first four miles of this route take you right along the water -- head out early to catch the breathtaking sunrise. If you’re feeling especially ambitious, take a left onto McKinley and go up, up, up before crossing Center Road and going down a steep decline to Bayshore Drive -- you could head back toward town along this road, catching views of West Grand Traverse Bay. Option #2: Check out the west side of the peninsula -- start at Bryant Park, at the base of the peninsula -- and follow Peninsula Drive for a picturesque out-and-back. Near the base of Old Mission Peninsula, at the intersection of Garfield Avenue and Munson Avenue, you&apos;ll find fantastic coffee, bagels and smoothies at Cuppa Joe. It&apos;s a popular drive-through coffee spot, but there are a few tables in the small sit-in area. For the ultimate city view, there is quite the climb involved. But trust me, it’s worth it. Especially during the fall. After warming up with a mile or two through downtown or along West Bay, head into Slabtown neighborhood on Traverse City’s west side and make your way toward Wayne Street. Just past Ashton Park, a small neighborhood green space on your right as you run westward, you’ll start to feel the road’s incline. Keep going -- all the way to the top, about three-quarters of a mile or so. You’ll want to stop at the top to take in the panoramic view (and maybe catch your breath). 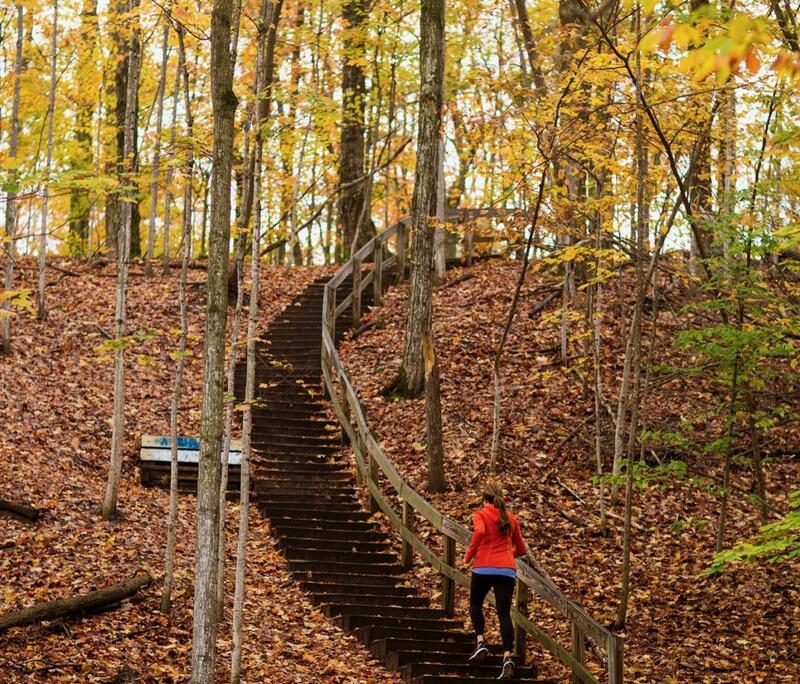 Once you make your way back down, take a right onto Madison Street and then another right onto Randolph Street, which takes you to Hickory Hills and lovely trails surrounded by towering trees. Not far from here is the Village at Grand Traverse Commons, where you’ll find even more scenic spots great for exploring and catching the fall color—and plenty of food and drink options at this area’s numerous eateries and coffee shops.